Butler has publicly spoken out against UC Berkeley before. 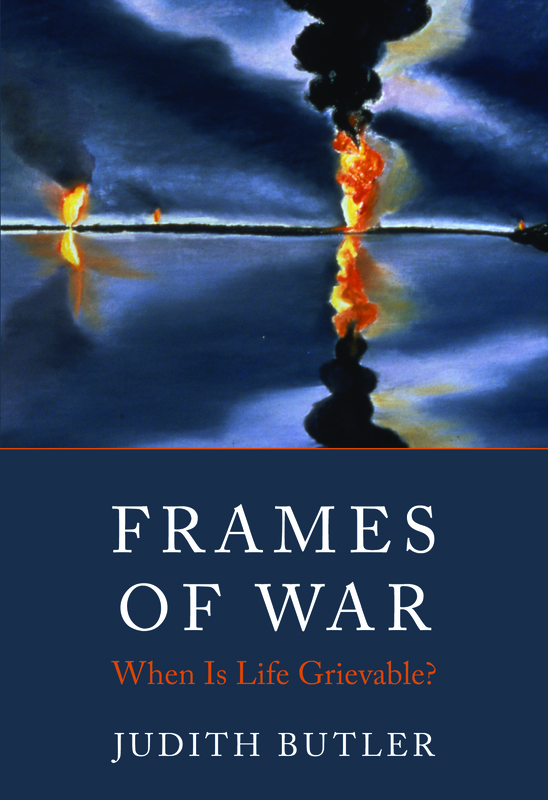 In Frames of War: When Is Life Grievable? Judith Butler explores the media’s portrayal of state violence, building on her work in Precarious Life: The Power of Mourning and Violence which critiques the use of violence that has emerged as a response to the experience of loss in post-9/11 America. Simon Critchley will be speaking on radical thinking and art at the London launch of set 4 of the Radical Thinkers project at the Tate Britain on November 26th: DON’T LOOK BACK: RADICAL THINKERS AND THE ARTS SINCE 1909. Join us for the London launch for Set 4 of Verso’s highly popular Radical Thinkers series, bringing together the seminal texts of the world’s leading intellectuals. On the 100th anniversary of the Futurism Manifesto, join critical thinkers TERRY EAGLETON, SIMON CRITCHLEY, KATE SOPER, EYAL WEIZMAN and CHAIR ALBERTO TOSCANO in exploring a century of radical thinking and the arts – and debating what lies ahead. The recent Futurism exhibition at Tate Modern reminds us of an age when politics and aesthetics were densely interwoven in an explosive rejection of the past. This distinguished panel will assess the legacy of modernism to ask how today’s radical thinkers might understand the role of the arts at the dawn of the twenty first century and beyond. For tickets book online here or call 020 7887 8888. Read Terry Eagleton’s ‘Waking the Dead’ article in the New Statesman, reflecting on what Benjamin’s approach to history and memory can tell us about America in the 21st century. SIMON CRITCHLEY is Professor of Philosophy at the New School for Social Research in New York and author of Ethics-Politics-Subjectivity: Derrida, Levinas and Contemporary French Thought in Set 4 of Radical Thinkers, Infinitely Demanding: Ethics of Commitment, Politics of Resistance, The Book of Dead Philosophers, On Humour and Continental Philosophy: A Very Short Introduction. KATE SOPER is a Professor in the Department of Humanities, Arts and Languages at London Metropolitan University and author of To Relish the Sublime? Culture and Self-Realization in Postmodern Times. EYAL WEIZMAN is an architect and Director of the Centre for Research Architecture at Goldsmiths College, University of London and author of Hollow Land: Israel’s Architecture of Occupation. Chair: ALBERTO TOSCANO, editor of Historical Materialism, lecturer in sociology at Goldsmiths College, University of London and author of The Theatre of Production: Philosophy and Individuation Between Kant and Deleuze and the forthcoming Fanaticism: On the Uses of an Idea. New York Radical Thinkers Set 4 launch with Critchley, Butler and Ranciere at the New School – Listen! Listen here to a conversation with Simon Critchley, Judith Butler and Jacques Rancière for the Philosophy Department Thursday Night Workshop Series at the New School in New York. Marking the release of a new set of titles in the acclaimed Radical Thinkers series, as well as publication of their own key texts, three of Verso’s most respected and influential writers met on Friday 23 October in New York to discuss the future of radical thought and the importance of critical theory to social movements today. JUDITH BUTLER is Maxine Elliot Professor of Rhetoric and Comparative Literature at the University of California, Berkeley. Her many books include Precarious Life: The Power of Mourning and Violence and, most recently Frames of War: When Is Life Grievable? JACQUES RANCIÈRE is a professor of philosophy at the University of Paris-VIII. His many books include On the Shores of Politics (part of Verso’s Radical Thinkers 2),The Future of the Image and Hatred of Democracy. The Emancipated Spectator is new from Verso. On the 100th anniversary of the Futurism Manifesto, join critical thinkers Terry Eagleton, Simon Critchley, Kate Soper, Eyal Weizman, and chair Alberto Toscano in exploring a century of radical thinking and the arts – and debating what lies ahead. The recent Futurism exhibition at Tate Modern reminds us of an age when politics and aesthetics were densely interwoven in an explosive rejection of the past. This distinguished panel will assess the legacy of modernism to ask how today’s radical thinkers might understand the role of the arts at the dawn of the twenty first century and beyond. Third Text, Volume 23, Issue 5, September 2009 announced a call for papers for its centenary issue and is itself a special issue entitled ‘Art: A Vision of the Future”. His latest book First as Tragedy, Then as Farce is out now. VOLUME 10 (2009) ISSUE 2 of Critical Horizons: A Journal of Philosophy and Social Theory is special issue edited by Robert Sinnerbrink and Philip A. Quadrio entitled Ethics of Commitment and Politics of Resistance: Simon Critchley’s Neo-Anarchism . The issue includes Simon Critchley’s article Mystical Anarchism. For the full contents list, see Continental Philosophy. For the clearest, boldest and most systematic statement of Simon Critchley’s influential views on philosophy, ethics, and politics, try Infinitely Demanding: Ethics of Commitment, Politics of Resistance. Part diagnosis of the times, part theoretical analysis of the impasses and possibilities of ethics and politics, part manifesto, Infinitely Demanding identifies a massive political disappointment at the heart of liberal democracy and argues that what is called for is an ethics of commitment that can inform a radical politics. For more of Critchley’s ethics, his contribution to the latest set of Radical Thinkers, Ethics-Politics-Subjectivity: Derrida, Levinas and Contemporary French Thought takes up three questions at the centre of contemporary theoretical debate:What is ethical experience? What can be said of the subject who has this experience? What, if any, is the relation of ethical experience to politics? Through spirited confrontations with major thinkers, such as Lacan, Nancy, Rorty, and, in particular, Levinas and Derrida, Critchley finds answers in a nuanced “ethics of finitude” and defends the political possibilities of deconstruction. Democracy, economics, friendship, and technology are all considered anew in Critchley’s bold excursions on the meaning and value of recent French philosophy. Read the full article on Guardian Cif here. Simon Critchley’s Ethics–Politics–Subjectivity: Derrida, Levinas, and Contemporary French Thought is out now as part of Radical Thinkers Set 4.